Membership is open to anyone with an interest in the study and practice of Choice Theory/ Reality Therapy (CTRT). Minimally begun training in a certification program endorsed by WGI and WGI(S). CTRTC who has minimally completed training in a certification program endorsed by WGI and WGI(S). CTRTC who has been accredited through mentoring in facilitation skills as an accredited Facilitator in good standing with WGI and WGI(S). Faculty in good standing with WGI and WGI(S). 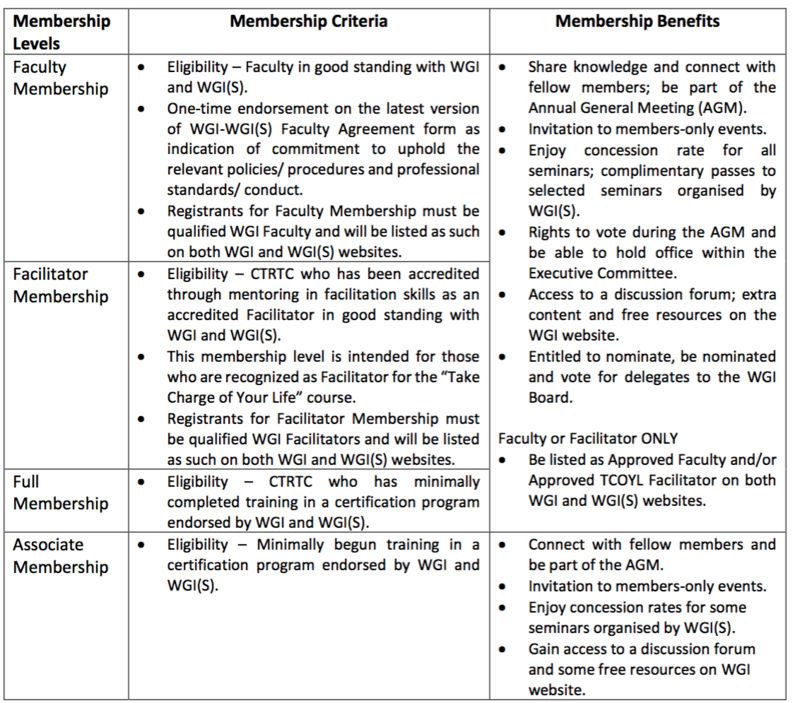 Please click here to download a copy of the WGI(S) Membership Application Form 2019. Please click here to download a copy of the WGI(S) Membership Renewal Form 2019. Please click here to download a copy of the Constitution.